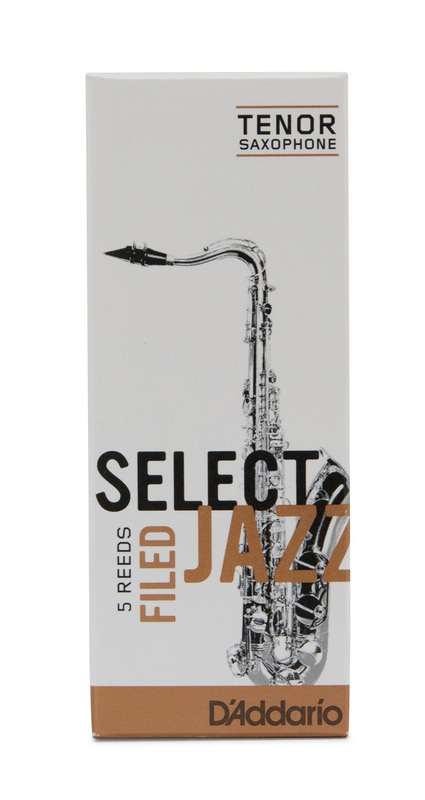 Known for many years as the Rico Select Jazz the new branding and packaging from 2016 onwards reflects the D Addario company ownership (that has actually been in place since 2004) and the reeds are now referred to as Select Jazz, or D Addario Select Jazz. The reeds are exactly the same, with the same geometry, manufacturing process, manufacturing location and indeed the same cane sourcing, it's only the packaging that has changed. Select Jazz reeds feature the thickest spine and blank of D Addarios jazz reeds, with a traditional tip shape. The Select Jazz cut offers great projection, focus, and a vibrant sound. The filed reeds offered here have a traditional scrape which takes a little more off the shoulders and offers a slightly more responsive and articulate sound. They are also generally more suited to mouthpieces with a gradual French style facing curve. Offered in third strengths, rather than half strengths, so players can choose the most precise strength for their individual equipment. The Select Jazz are the choice of top Sax Professionals around the world. Produced from highest quality naturally produced cane. Supplied in Box of 5 reeds. Offered in third strengths for more accurate choice and supply in each box. Suitable for all commercial, jazz, funk, pop, big band etc genres. Filed reed for quick response and easier articulation. Good Quality reeds that do exactly what they should do, with a great tone. I'M STILL BLOWING THE FIRST ONE IN. Reeds for son's sax as he cannot afford to buy them himself, over £3 each. He seems to get through lots of them. He says that Rico Jazz select are the best. The products are always as described and sent very quickly.